The base of this course starts in traditional Bachata from the Dominican Republic with a focus on a full 8-count step pattern moving within a square, consisting of three steps and then a tap or various forms of step syncopations (such as the “double step”). WE ARE BIG ON BASICS! The higher levels focus first on developing basic movements in various directions while in partner and start infusing Modern Western Movements and Turn Patterns that compliments the more contemporary bachata music that has gained mainstream popularity today. The course focuses on Cross Body Lead and is danced on 1 (The First Beat Of The Music). Levels 1 and 2 focus on training the follower to maintain the slot, while training the lead to navigate getting on and off the line of dance. 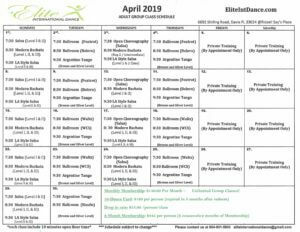 Having already an established good crossbody lead as well as good balance turning left and right and good timing, this course focuses on accents in the music and how to dance to them as well as complicated turn patterns and shines.